In 2015, there were 1,966,324 registered notifications about attempted malware infections that aimed to steal money via online access to bank accounts. Ransomware programs were detected on 753,684 computers of unique users; 179,209 computers were targeted by encryption ransomware. Kaspersky Lab’s web antivirus detected 121,262,075 unique malicious objects: scripts, exploits, executable files, etc. Kaspersky Lab solutions repelled 798,113,087 attacks launched from online resources located all over the world. 34.2% of user computers were subjected to at least one web attack over the year. To carry out their attacks, cybercriminals used 6,563,145 unique hosts. 24% of web attacks neutralized by Kaspersky Lab products were carried out using malicious web resources located in the US. Kaspersky Lab’s antivirus solutions detected a total of 4,000,000 unique malicious and potentially unwanted objects. The detection of two families of critical vulnerabilities for Android was one of the more remarkable events of the year. Exploiting Stagefright vulnerabilities enabled an attacker to remotely execute arbitrary code on a device by sending a specially crafted MMS to the victim’s number. Exploiting Stagefright 2 pursued the same purpose, but this time using a specially crafted media file. 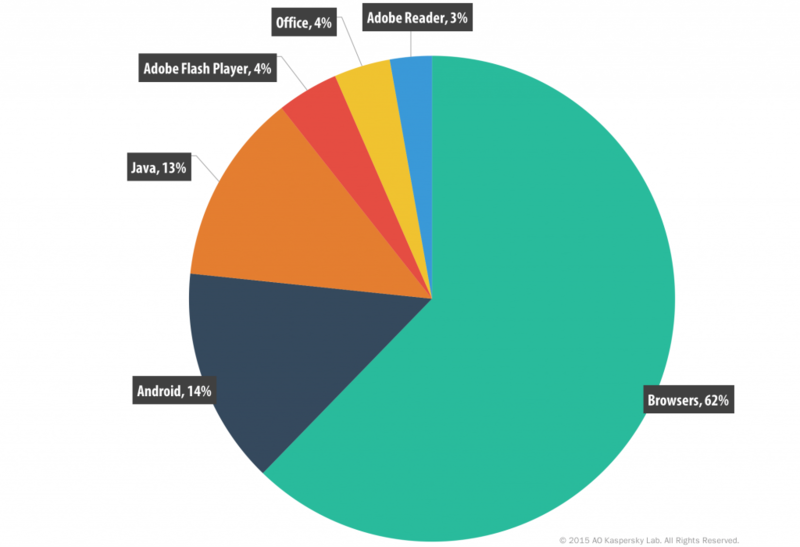 Exploits for Adobe Flash Player were popular among malware writers in 2015. This can be explained by the fact that a large number of vulnerabilities were identified in the product throughout the year. In addition, cybercriminals used the information about unknown Flash Player vulnerabilities that became public as a result of the Hacking Team data breach. Some well-known exploit packs have traditionally included an exploit for an Internet Explorer vulnerability (CVE-2015-2419). We also saw a Microsoft Silverlight vulnerability (CVE-2015-1671) used in 2015 to infect users. It is worth noting, however, that this exploit is not popular with the main ‘players’ in the exploit market. 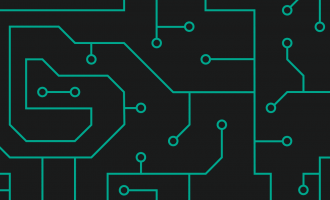 Vulnerable applications were ranked based on data on exploits blocked by Kaspersky Lab products, used both for online attacks and to compromise local applications, including those on mobile devices. Although the share of exploits for Adobe Flash Player in our ranking was only 4%, they are quite common in the wild. When looking at these statistics, it should be kept in mind that Kaspersky Lab technologies detect exploits at different stages. As a result, the Browsers category (62%) also includes the detection of landing pages that serve exploits. According to our observations, exploits for Adobe Flash Player are most commonly served by such pages. 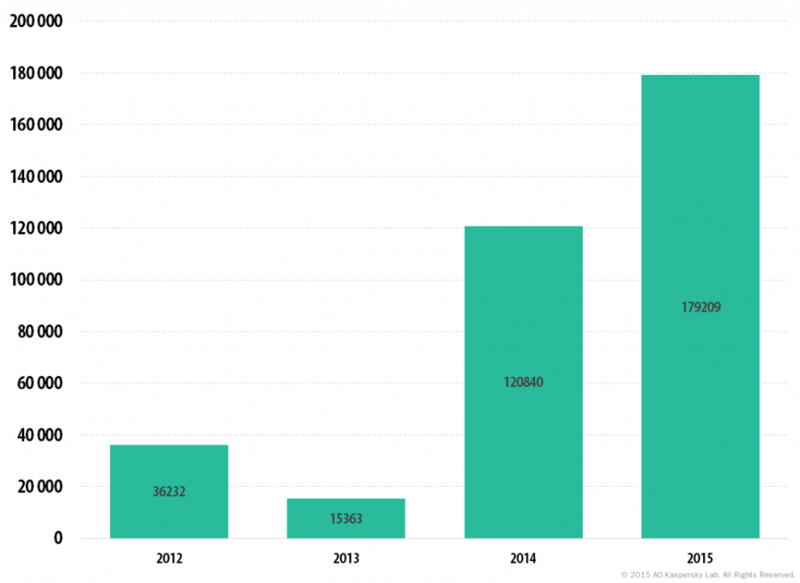 We saw the number of cases which involved the use of Java exploits decrease over the year. In late 2014 their proportion of all the exploits blocked was 45%, but this proportion gradually diminished by 32 p.p. during the year, falling to 13%. Moreover, Java exploits have now been removed from all known exploit packs. At the same time, the use of Microsoft Office exploits increased from 1% to 4%. Based on our observations, in 2015 these exploits were distributed via mass emailing. These statistics are based on the detection verdicts returned by the antivirus module, received from users of Kaspersky Lab products who have consented to provide their statistical data. The annual statistics for 2015 are based on data received between November 2014 and October 2015. In 2015, Kaspersky Lab solutions blocked attempts to launch malware capable of stealing money via online banking on 1,966,324 computers. This number is 2.8% higher than in 2014 (1,910,520). 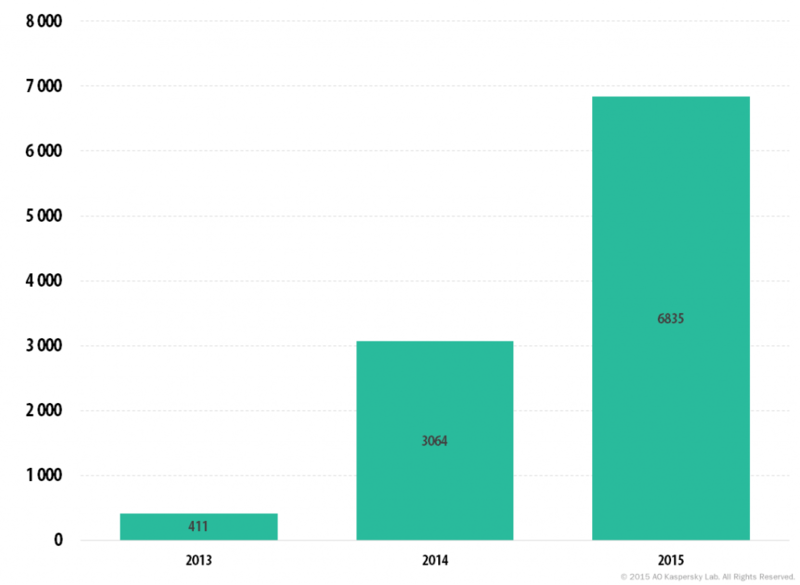 In 2015, the number of attacks grew steadily from February till April, with the peak in March-April. Another burst was recorded in June. 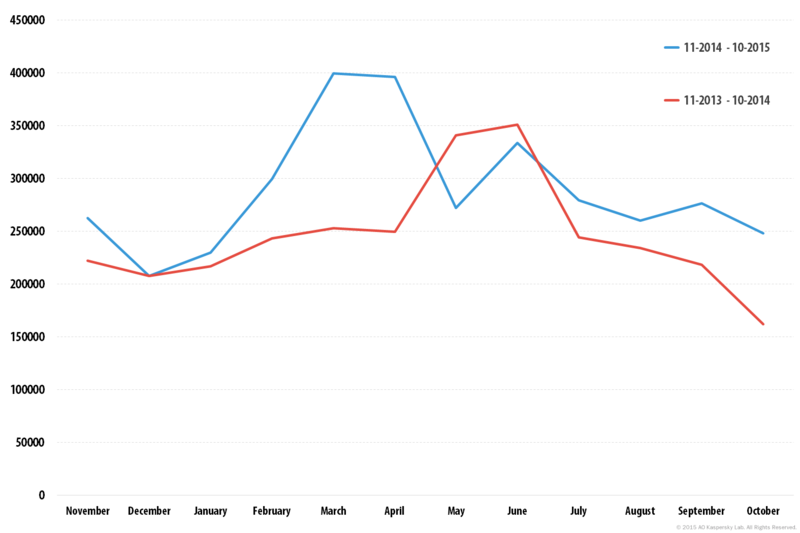 In 2014, most users were targeted by financial malware in May and June. During the period between June and October in both 2014 and 2015 the number of users attacked fell gradually. In order to evaluate the popularity of financial malware among cybercriminals and the risk of user computers around the world being infected by banking Trojans, we calculate the percentage of Kaspersky Lab users who encountered this type of threat during the reporting period in the country, relative to all users of our products in the county. 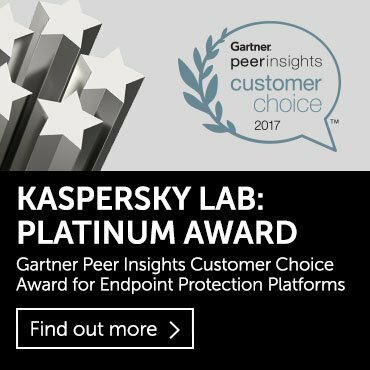 * We excluded those countries in which the number of Kaspersky Lab product users is relatively small (less than 10,000). ** Unique users whose computers have been targeted by web attacks as a percentage of all unique users of Kaspersky Lab products in the country. Singapore leads this rating. Of all the Kaspersky Lab users attacked by malware in the country, 11.6% were targeted at least once by banking Trojans throughout the year. This reflects the popularity of financial threats in relation to all threats in the country. 5.4% of users attacked in Spain encountered a banking Trojan at least once in 2015. The figure for Italy was 5%; 5.1% in Britain; 3.8% in Germany; 2.9% in France; 3.2% in the US; and 2.5% in Japan. 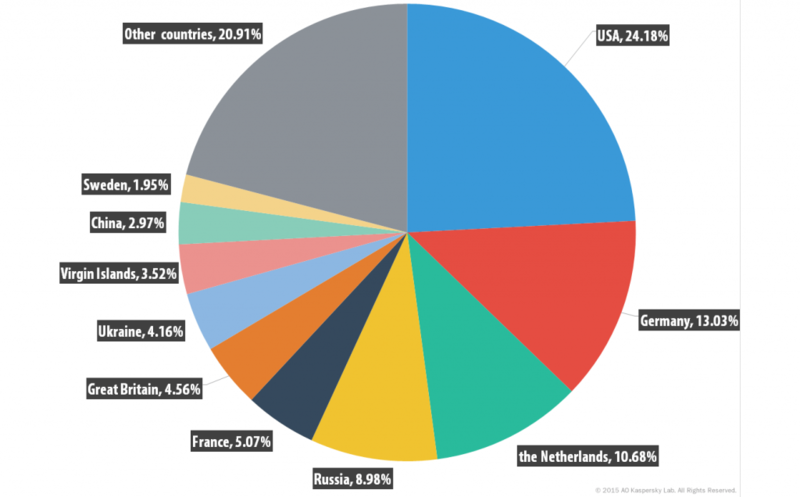 2% of users attacked in Russia were targeted by banking Trojans. * These statistics are based on the detection verdicts returned by Kaspersky Lab’s products, received from users of Kaspersky Lab products who have consented to provide their statistical data. ** Unique users whose computers have been targeted by the malicious program, as a percentage of all unique users targeted by financial malware attacks. The majority of the Top 10 malicious programs work by injecting random HTML code in the web page displayed by the browser and intercepting any payment data entered by the user in the original or inserted web forms. The Trojan-Downloader.Win32.Upatre family of malicious programs remained at the top of the ranking throughout the year. The malware is no larger than 3.5 KB in size, and is limited to downloading the payload to the victim computer, most typically a banker Trojan from the Dyre/Dyzap/Dyreza family whose main aim is to steal the user’s payment details. Dyre does this by intercepting the data from a banking session between the victim’s browser and the online banking web app, in other words, by using a Man-in-the-Browser (MITB) technique. This malicious program is spread via specially created emails with an attachment containing a document with the downloader. In the summer of 2015, however, Trojan-Downloader.Win32.Upatre was spotted on compromised home routers, which is a testimony to how cybercriminals make use of this multi-purpose malware. Yet another permanent resident of this ranking is Trojan-Spy.Win32.Zbot (in second place) which consistently occupies one of the leading positions. The Trojans of the Zbot family were among the first to use web injections to compromise the payment details of online banking users and to modify the contents of banking web pages. They encrypt their configuration files at several levels; the decrypted configuration file is never stored in the memory in its entirety, but is instead loaded in parts. Representatives of the Trojan-Banker.Win32.ChePro family were first detected in October 2012. At that time, these banking Trojans were mostly aimed at users in Brazil, Portugal and Russia. Now they are being used to attack the users worldwide. Most programs of this type are downloaders which need other files to successfully infect the system. Generally, they are malicious banking programs, allowing the fraudsters to take screenshots, to intercept keystrokes, and to read the content of the copy buffer, i.e. they possess functionality that allows a malicious program to be used for attacks on almost any online banking system. Of particular interest is the fact that two families of mobile banking Trojans are present in this ranking: Faketoken and Marcher. The malicious programs belonging to the latter family steal payment details from Android devices. The representatives of the Trojan-Banker.AndroidOS.Faketoken family work in partnership with computer Trojans. To distribute this malware, cybercriminals use social engineering techniques. When a user visits his online banking account, the Trojan modifies the page, asking him to download an Android application which is allegedly required to securely confirm the transaction. In fact the link leads to the Faketoken application. Once Faketoken is on the user’s smartphone, the cybercriminals gain access to the user’s banking account via the computer infected with the banking Trojan and the compromised mobile device allows them to intercept the one-time confirmation code (mTAN). The second family of mobile banking Trojans is Trojan-Banker.AndroidOS.Marcher. After infecting a device, the malware tracks the launch of just two apps – the mobile banking customer of a European bank and Google Play. If the user starts Google Play, Marcher displays a false window requesting credit card details which then go to the fraudsters. The same method is used by the Trojan if the user starts the banking application. The Trojan-Ransom class represents malware intended for the unauthorized modification of user data that renders a computer inoperable (for example, encryptors), or for blocking the normal operation of a computer. In order to decrypt files and unblock a computer the malware owners usually demand a ransom from the victims. Since its emergence with CryptoLocker in 2013, ransomware has come a long way. For example, in 2014 we spotted the first version of ransomware for Android. Just a year later, 17% of the infections we saw were on Android devices. 2015 also saw the first ransomware for Linux, which can be found in the Trojan-Ransom.Linux class. On the positive side, the malware authors made a small implementation error, which makes it possible to decrypt the files without paying a ransom. Unfortunately, these implementation errors are occurring less and less. This prompted the FBI to state: “The ransomware is that good… To be honest, we often advise people just to pay the ransom”. That this is not always a good idea was also shown this year, when the Dutch police were able to apprehend two suspects behind the CoinVault malware. A little later we received all 14,000 encryption keys, which we added to a new decryption tool. All the CoinVault victims were then able to decrypt their files for free. 2015 was also the year that marked the birth of TeslaCrypt. TeslaCrypt has a history of using graphical interfaces from other ransomware families. Initially it was CryptoLocker, but this later changed to CryptoWall. This time they copied the HTML page in full from CryptoWall 3.0, only changing the URLs. 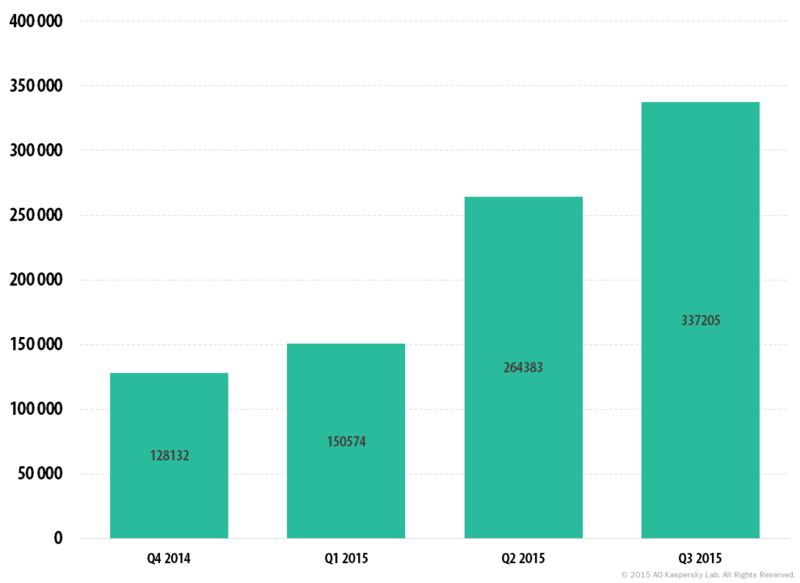 Overall in 2015, Trojan-Ransom was detected on 753,684 computers. Ransomware is thus becoming more and more of a problem. The Top 10 most prevalent ransomware families are represented here. The list consists of browser-based extortion or blocker families and some notorious encryptors. So-called Windows blockers that restrict access to a system (for example, the Trojan-Ransom.Win32.Blocker family) and demand a ransom were very popular a few years ago – starting off in Russia then moving west – but are not as widespread anymore and are not represented in the Top 10. 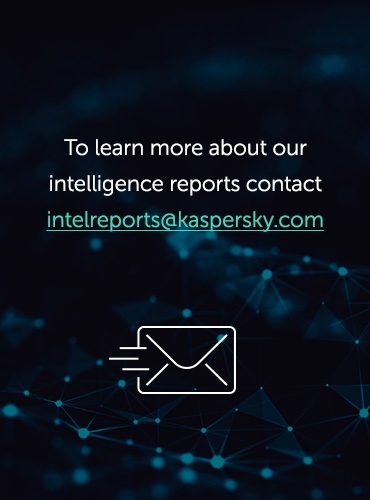 *These statistics are based on the detection verdicts returned by Kaspersky Lab products, received from users of Kaspersky Lab products who have consented to provide their statistical data. 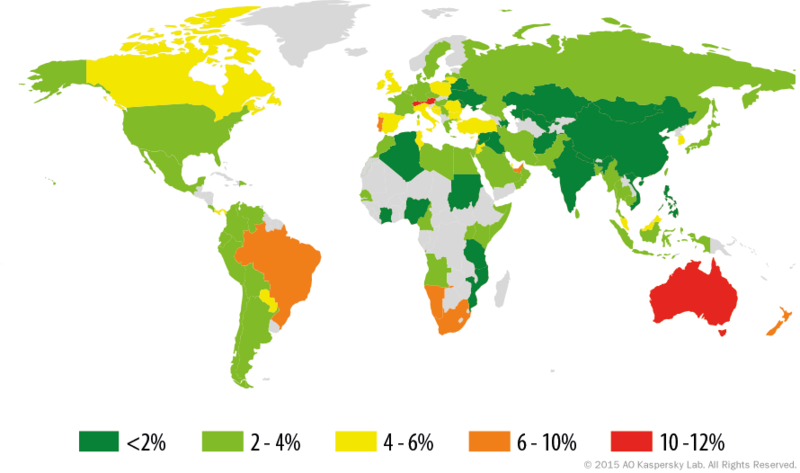 ** Percentage of users attacked by a Trojan-Ransom family relative to all users attacked with Trojan-Ransom malware. In third place is Trojan-Ransom.JS.InstallExtension (8%), a browser-blocking web page that imposes a Chrome extension installation on the user. When attempting to close the page a voice mp3 file is often played: “In order to close the page, press the ‘Add’ button”. The extensions involved are not harmful, but the offer is very obtrusive and difficult for the user to reject. This kind of extension propagation is used by a partnership program. These three families are particularly prevalent in Russia and almost as prevalent in some post-Soviet countries. When we look at where ransomware is most prevalent (not just the three families mentioned above), we see that the top three consists of Kazakhstan, Russia and Ukraine. 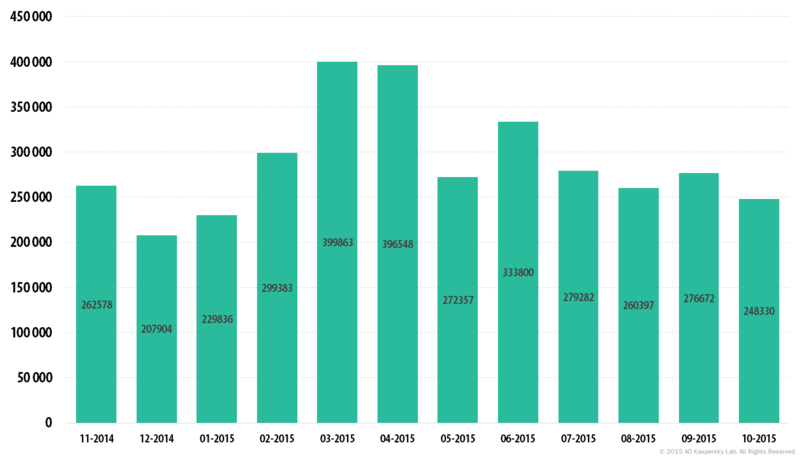 Cryakl became relatively active in Q3 2015, when we saw peaks of up to 2300 attempted infections a day. An interesting aspect of Cryakl is its encryption scheme. Rather than encrypting the whole file, Cryakl encrypts the first 29 bytes plus three other blocks located randomly in the file. This is done to evade behavioral detection, while encrypting the first 29 bytes destroys the header. Encryptors can be implemented not only as executables but also using simple scripting languages, as in the case of the Trojan-Ransom.BAT.Scatter family. The Scatter family appeared in 2014 and quickly evolved, providing itself with the functionality of Email-Worm and Trojan-PSW. Encryption makes use of two pairs of assymetric keys, making it possible to encrypt the user’s files without revealing their private key. It employs renamed legitimate utilities to encrypt files. The Trojan-Ransom.Win32.Shade encryptor, which is also very prevalent in Russia, is able to request a list from the C&C server containing the URLs of additional malware. It then downloads that malware and installs it in the system. All its C&C servers are located in the Tor network. Shade is also suspected of propagating via a partnership program. **Unique users whose computers have been targeted by Trojan-Ransom as a percentage of all unique users of Kaspersky Lab products in the country. Even if today’s encryptors are not as popular among cybercriminals as blockers were, they inflict more damage on users. So it’s worth investigating them separately. The following graph represents the rise of newly created encryptor modifications per year. The overall number of encryptor modifications in our Virus Collection to date is at least 11,000. Ten new encryptor families were created in 2015. In 2015, 179,209 unique users were attacked by encryptors. About 20% of those attacked were in the corporate sector. It is important to keep in mind that the real number of incidents is several times higher: the statistics reflect only the results of signature-based and heuristic detections, while in most cases Kaspersky Lab products detect encryption Trojans based on behavior recognition models. **Unique users whose computers have been targeted by Trojan-Ransom encryptor malware as a percentage of all unique users of Kaspersky Lab products in the country. First place is occupied by the Netherlands. The most widespread encryptor family is CTB-Locker (Trojan-Ransom.Win32/NSIS.Onion). In 2015 an affiliate program utilizing CTB-Locker was launched and new languages were added including Dutch. Users are mainly infected by emails with malicious attachments. It appears there may be a native Dutch speaker involved in the infection campaign, as the emails are written in relatively good Dutch. A similar situation exists in Belgium: CTB-Locker is the most widespread encryptor there, too. In Russia, Trojan-Ransom.Win32.Cryakl tops the list of encryptors targeting users. The statistics in this section were derived from web antivirus components that protect users from attempts to download malicious objects from a malicious/infected website. Malicious websites are deliberately created by malicious users; infected sites include those with user-contributed content (such as forums), as well as compromised legitimate resources. Throughout 2015, Kaspersky Lab’s web antivirus detected 121,262,075 unique malicious objects: scripts, exploits, executable files, etc. We identified the 20 malicious programs most actively involved in online attacks launched against computers in 2015. As in the previous year, advertising programs and their components occupy 12 positions in that Top 20. During the year, advertising programs and their components were registered on 26.1% of all user computers where our web antivirus is installed. The increase in the number of advertising programs, their aggressive distribution methods and their efforts to counteract anti-virus detection, continue the trend of 2014. Although aggressive advertising does annoy users, it does not harm computers. That is why we have compiled another rating of exclusively malicious objects detected online that does not include the Adware or Riskware classes of program. These 20 programs accounted for 96.6% of all online attacks. * These statistics represent detection verdicts from the web antivirus module. Information was provided by users of Kaspersky Lab products who consented to share their local data. ** The percentage of all malware web attacks recorded on the computers of unique users. As is often the case, the TOP 20 is largely made up of objects used in drive-by attacks. They are heuristically detected as Trojan.Script.Generic, Expoit.Script.Blocker, Trojan-Downloader.Script.Generic, etc. These objects occupy seven positions in the ranking. Malicious URL in first place is the verdict identifying links from our black list (links to web pages containing redirects to exploits, sites with exploits and other malicious programs, botnet control centers, extortion websites, etc.). The Trojan.JS.Redirector.ads verdict (8th place) is assigned to script that cybercriminals place on infected web resources. It redirects users to other websites, such as those of online casinos. The fact that this verdict is included in the rating should serve as a reminder to web administrators of how easily their sites can be automatically infected by programs – even those that are not very complex. The Trojan-Ransom.JS.Blocker.a verdict (9th place) is a script that tries to block the browser by means of a cyclic update of the page, and displays a message stating that a “fine” needs to be paid for viewing inappropriate materials. The user is told to transfer the money to a specified digital wallet. This script is mostly found on pornographic sites and is detected in Russia and CIS countries. The script with the Trojan-Downloader.JS.Iframe.djq verdict (11th place) is found on infected sites running under WordPress, Joomla and Drupal. The campaign launched to infect sites with this script began on a massive scale in August 2015. First, it sends information about the header of the infected page, the current domain, and the address from which the user landed on the page with the script to the fraudsters’ server. Then, by using iframe, another script is downloaded in the user’s browser. It collects information about the system on the user’s computer, the time zone and the availability of Adobe Flash Player. After this and a series of redirects, the user ends up on sites that prompt him to install an update for Adobe Flash Player that is actually adware, or to install browser plugins. The following statistics are based on the physical location of the online resources that were used in attacks and blocked by our antivirus components (web pages containing redirects to exploits, sites containing exploits and other malware, botnet command centers, etc.). Any unique host could be the source of one or more web attacks. The statistics do not include sources used for distributing advertising programs or hosts linked to advertising program activity. In order to determine the geographical source of web-based attacks, domain names are matched up against their actual domain IP addresses, and then the geographical location of a specific IP address (GEOIP) is established. In 2015, Kaspersky Lab solutions blocked 798,113,087 attacks launched from web resources located in various countries around the world. To carry out their attacks, the fraudsters used 6,563,145 unique hosts. 80% of notifications about attacks blocked by antivirus components were received from online resources located in 10 countries. The top four countries where online resources are seeded with malware remained unchanged from the previous year. France moved up from 7th to 5th place (5.07%) while Ukraine dropped from 5th to 7th position (4.16%). Canada and Vietnam left the Top 20. This year’s newcomers, China and Sweden, were in 9th and 10th places respectively. This rating demonstrates that cybercriminals prefer to operate and use hosting services in different countries where the hosting market is well-developed. In order to assess the countries in which users most often face cyber threats, we calculated how often Kaspersky Lab users encountered detection verdicts on their machines in each country. 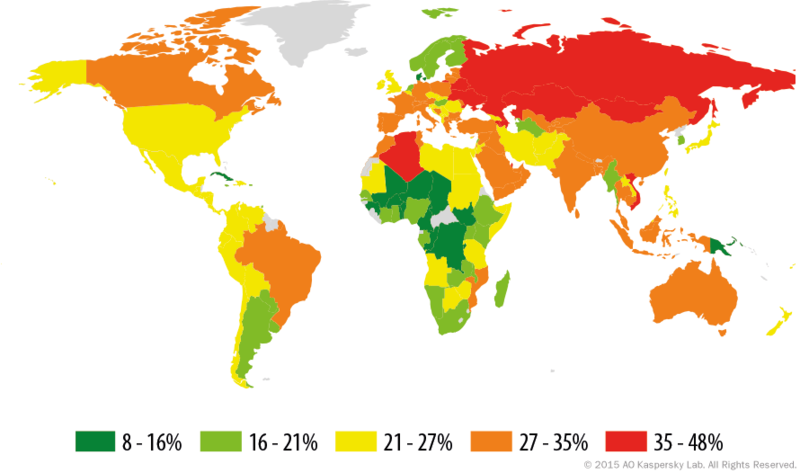 The resulting data characterizes the risk of infection that computers are exposed to in different countries across the globe, providing an indicator of the aggressiveness of the environment facing computers in different parts of the world. These statistics are based on the detection verdicts returned by the web antivirus module, received from users of Kaspersky Lab products who have consented to provide their statistical data. In 2015, the top three saw no change from the previous year. Russia remained in first place although the percentage of unique users in the country decreased by 4.9 p.p. Germany, Tajikistan, Georgia, Saudi Arabia, Austria, Sri Lanka and Turkey left the Top 20. Among the newcomers are Latvia, Nepal, Brazil, China, Thailand, the United Arab Emirates and Portugal. The countries can be divided into three groups that reflect the different levels of infection risk. In 2015, this group includes the first three countries from the Top 20 – Russia, Kazakhstan and Azerbaijan. This group includes 109 countries; among them are France (32.1%), Germany (32.0%), India (31.6%), Spain (31.4%), Turkey (31.0%), Greece (30.3%), Canada (30.2%), Italy (29.4%), Switzerland (28.6%), Australia (28.0%), Bulgaria (27.0%), USA (26.4%), Georgia (26, 2%), Israel (25.8%), Mexico (24.3%), Egypt (23.9%), Romania (23.4%), UK (22.4%), Czech Republic (22.0% ), Ireland (21.6%), and Japan (21.1%). The 52 countries with the safest online surfing environments include Kenya (20.8%), Hungary (20.7%), Malta (19.4%), the Netherlands (18.7%), Norway (18.3%), Argentina (18.3%), Singapore (18,2%), Sweden (18%), South Korea (17.2%), Finland (16.5%), and Denmark (15, 2%). In 2015, 34.2% of computers were attacked at least once while their owners were online. Secondly, users are using more and more mobile devices and tablets to surf the Internet. Thirdly, many exploit packs have started to check if Kaspersky Lab’s product is installed on the user’s computer. If it is, the exploits do not even try to attack the computer. Local infection statistics for user computers are a very important indicator: they reflect threats that have penetrated computer systems by infecting files or removable media, or initially got on the computer in an encrypted format (for example, programs integrated in complex installers, encrypted files, etc.). In addition, these statistics include objects detected on user computers after the first scan of the system by Kaspersky Lab’s file antivirus. This section contains an analysis of the statistical data obtained based on antivirus scans of files on the hard drive at the moment they are created or accessed, and the results of scanning various removable data storages. In 2015, Kaspersky Lab’s antivirus solutions detected 4 million unique malicious and potentially unwanted objects, a twofold increase from the previous year. For this rating we identified the 20 most frequently detected threats on user computers in 2015. This rating does not include the Adware and Riskware classes of program. These statistics are compiled from malware detection verdicts generated by the on-access and on-demand scanner modules on the computers of those users running Kaspersky Lab products who consented to submit their statistical data. * Malware detection verdicts generated by the on-access and on-demand scanner modules on the computers of those users running Kaspersky Lab products who consented to submit their statistical data. ** The proportion of individual users on whose computers the antivirus module detected these objects as a percentage of all individual users of Kaspersky Lab products on whose computers a malicious program was detected. The DangerousObject.Multi.Generic verdict, which is used for malware detected with the help of cloud technologies, is in 1st place (39.7%). Cloud technologies work when the antivirus databases do not yet contain either signatures or heuristics to detect a malicious program but the company’s cloud antivirus database already has information about the object. In fact, this is how the very latest malware is detected. The proportion of viruses continues to decrease: for example, last year Virus.Win32.Sality.gen affected 6.69% of users while in 2015 – only 5.53%. For Virus.Win32.Nimnul these figures are 2.8% in 2014 and 2.37% in 2015. The Trojan-Dropper.VBS.Agent.bp verdict, which is 20th in the rating, is a VBS script that extracts Virus.Win32.Nimnul from itself and saves in to the disk. In addition to heuristic verdicts and viruses the Top 20 includes verdicts for worms spread on removable media and their components. Their presence in this rating is due to the nature of their distribution and creation of multiple copies. A worm can continue to self-proliferate for a long time even if its management servers are no longer active. For each country we calculated the number of file antivirus detections the users faced during the year. The data includes detected objects located on user computers or on removable media connected to the computers, such as flash drives, camera and phone memory cards, or external hard drives. This statistic reflects the level of infected personal computers in different countries around the world. * When calculating, we excluded countries where there are fewer than 10,000 Kaspersky Lab users. ** The percentage of unique users in the country with computers that blocked local threats as a percentage of all unique users of Kaspersky Lab products. For the third year in a row Vietnam topped the rating. Mongolia and Bangladesh swapped places – Bangladesh climbed from 4th to 2nd, while Mongolia moved from 2nd to 4th. Russia, which was not in last year’s Top 20, came third in 2015. India, Afghanistan, Egypt, Saudi Arabia, Sudan, Sri Lanka, Myanmar, and Turkey all left the Top 20. The newcomers were Russia, Armenia, Somalia, Georgia, Iran, Rwanda, the Palestinian territories, and Ukraine. In the Top 20 countries at least one malicious object was found on an average of 67.7% of computers, hard drives or removable media belonging to KSN users. The 2014 the figure was 58.7%. The countries can be divided into several risk categories reflecting the level of local threats. High risk (41-60%): 98 countries including India (59.7%), Egypt (57.3%), Belarus (56.7%), Turkey (56.2%), Brazil (53.9%), China (53.4%), UAE (52.7%), Serbia (50.1%), Bulgaria (47.7%), Argentina (47.4%), Israel (47.3%), Latvia (45.9%), Spain (44.6%), Poland (44.3%), Germany (44%), Greece (42.8%), France (42.6%), Korea (41.7%), Austria (41.7%). Moderate local infection rate (21-40.99%): 45 countries including Romania (40%), Italy (39.3%), Canada (39.2%), Australia (38.5%), Hungary (38.2%), Switzerland (37.2%), USA (36.7%), UK (34.7%), Ireland (32.7%), Netherlands (32.1%), Czech Republic (31.5%), Singapore (31.4%), Norway (30.5%), Finland (27.4%), Sweden (27.4%), Denmark (25.8%), Japan (25.6%). 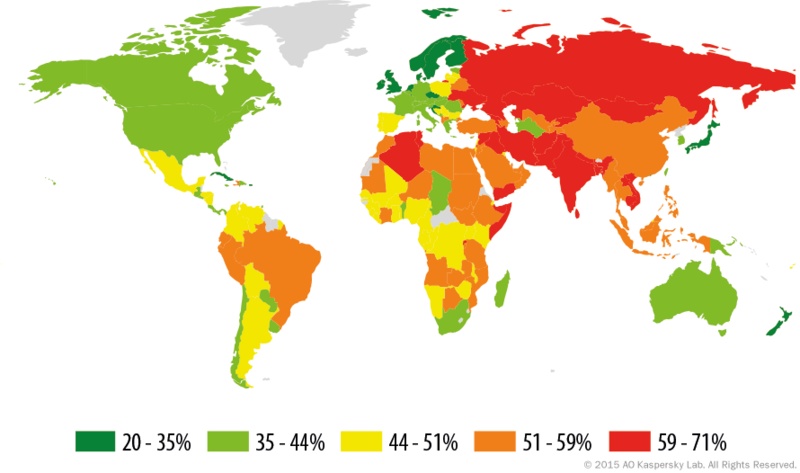 * The percentage of unique users in the country with computers that blocked local threats as a percentage of all unique users of Kaspersky Lab products. The appearance of Andorra, replacing Martinique, was the only change to this rating in 2015 compared to the previous year. On average, 26.9% of user computers were attacked at least once during the year in the 10 safest countries. This is an increase of 3.9 p.p. compared to 2014. Some of those involved in cybercrime are looking to minimize the risk of criminal prosecution and switching from malware attacks to the aggressive distribution of adware. The proportion of relatively simple programs used in mass attacks is growing. This approach allows the attackers to quickly update malware which enhances the effectiveness of attacks. Attackers have mastered non-Windows platforms – Android and Linux: almost all types of malicious programs are created and used for these platforms. Cybercriminals are making active use of Tor anonymization technology to hide command servers, and Bitcoins for making transactions. An increasing proportion of antivirus detections fall into a ‘gray zone’. This applies primarily to a variety of advertising programs and their modules. In our 2015 ranking of web-based threats, the representatives of this class of program occupy 12 places in the Top 20. During the year, advertising programs and their components were registered on 26.1% of all user computers where our web antivirus is installed. The growth in the volume of advertising programs, along with their aggressive distribution methods and attempts to counteract anti-virus detection, continues the trend of 2014. Spreading adware earns good money, and in the pursuit of profit the authors sometimes use the tricks and technologies typical of malicious programs. In 2015, virus writers demonstrated a particular interest in exploits for Adobe Flash Player. According to our observations, landing pages with exploits are often downloaded by exploits for Adobe Flash Player. There are two factors at play here: firstly, a large number of vulnerabilities were detected in the product over the year; secondly, as a result of a data leak by Hacking Team, information about previously unknown vulnerabilities in Flash Player were made public, and attackers wasted no time in taking advantage. The banking Trojan sphere witnessed an interesting development in 2015. The numerous modifications of ZeuS, which had continuously topped the ranking of the most commonly used malware families for several years, were dethroned by Trojan-Banker.Win32.Dyreza. Throughout the year, the rating for malicious programs designed to steal money via Internet banking systems was headed by Upatre, which downloads banking Trojans from the family known as Dyre/Dyzap/Dyreza to victims’ computers. In the banking Trojan sector as a whole, the share of users attacked by Dyreza exceeded 40%. The banker uses an effective of web injection method in order to steal data to access the online banking system. Also of note is the fact that two families of mobile banking Trojans – Faketoken and Marcher – were included in the Top 10 banking Trojans most commonly used in 2015. Based on current trends, we can assume that next year mobile bankers will account for a much greater percentage in the rating. While the popularity of blockers is gradually falling, the number of users attacked by encryption ransomware increased by 48.3% in 2015. Encrypting files instead of simply blocking the computer is a method that in most cases makes it very difficult for the victims to regain access to their information. The attackers are especially active in utilizing encryption ransomware for attacks on business users, who are more likely to pay a ransom than ordinary home users. This is confirmed by the appearance in 2015 of the first ransomware for Linux, targeting web servers. At the same time, encryptors are becoming multi-module and, in addition to encryption, include functionality designed to steal data from user computers. While Linux may only now have attracted the attention of fraudsters, the first ransomware Trojan for Android was detected back in 2014. In 2015, the number of attacks aimed at the Android OS grew rapidly, and by the end of the year 17% of attacks involving ransomware were blocked on Android devices. The threat is actively spreading all over the planet: Kaspersky Lab products detected ransomware Trojans in 200 countries and territories, which is practically everywhere. We expect that in 2016 cybercriminals will continue to develop encryption ransomware that targets non-Windows platforms: the proportion of encryptors targeting Android will increase, while others will emerge for Mac. Given that Android is widely used in consumer electronics, the first ransomware attack on ‘smart’ devices may occur. I am very glad that TECH 505 Computers in Albuquerque, NM installed Kaspersky on our CPU. We will now install it on our second CPU which has Webroot. Is the geographic information available in data format for all countries? I’m interested in time-series modeling of risk by country. Thank you!